Kirby: Rainbow Curse is the newest title in the Kirby series. Unlike last year's Triple Deluxe, Rainbow Curse is not a traditional Kirby platformer. Instead, Rainbow Curse follows in the footprints of DS title Kirby: Canvas Curse. And let me tell you, its relationship to its portable forebear becomes obvious quite quickly. In the hours I spent with Kirby: Rainbow Curse, I don't think I looked at my TV monitor once past the opening cutscene—and in my later play sessions, I didn't even bother to turn on my TV monitor. This is because Kirby: Rainbow Curse is played entirely on the gamepad's touch screen. In fact, every button except the pause button does literally nothing at all. You never really control Kirby in Kirby: Rainbow Curse. Rather, you take the role of the magic flying paintbrush Eleene and draw lines of paint into the game. These lines act as conveyor belts, moving the ball-like Kirby in whichever direction the line is drawn. To make Kirby attack, you simply tap him to get a short Sonic the Hedgehog-like spin-dash. Every once in a while, you'll collect enough of the stars scattered about each stage to touch and hold Kirby to activate his special attack. This causes him to grow to enormous size and break through many of each stage's obstacles. These are the basics of gameplay in Kirby: Rainbow Curse. You draw paths for Kirby to take and tap him at the right moments. And while simple in principle, the game throws so much at you that it gets rather complex and hectic by the end of the game. 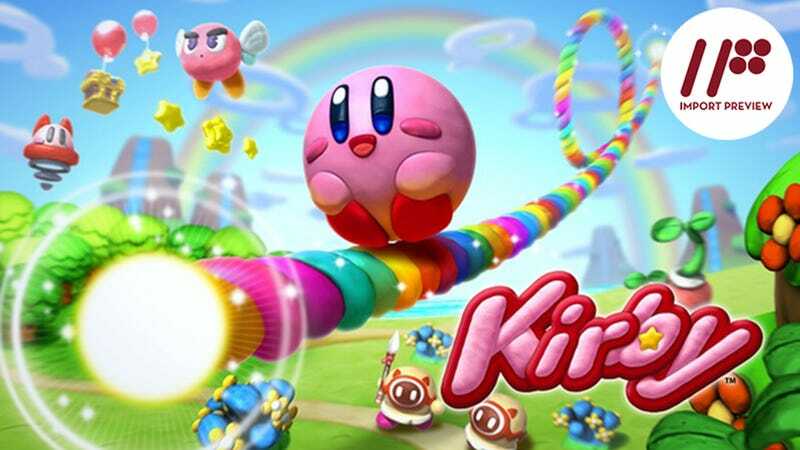 There are 28 stages across seven worlds in Kirby: Rainbow Curse—with each world introducing a new gameplay element. One world, for example, introduces water stages (where gravity is basically reversed as Kirby floats). Another adds sand which can only be dissolved by drawing a line of paint through it. Gameplay is also changed up from time to time through Kirby being re-painted into various powerful vehicles. As a tank, Kirby can shoot as he drives along. While in submarine form, on the other hand, he auto fires missiles that can only be aimed by drawing lines to guide them. One of these vehicle stages tends to pop up in each world, providing a welcome change of pace. Each world also comes with its own boss—though some of the later bosses are upgraded versions of the early ones. These bosses are excellently designed to put to use all you have learned throughout the previous stages. However, the second boss (and later his upgraded form) in particular exemplifies the only real negative I experienced with this game—the rare but sudden difficulty spikes. Kirby: Rainbow Curse is not a game that gives out lives en masse. However, through worlds one and two I collected more than a few as I never died. Then, I hit the second boss and lost nearly all of them—the game even asking me after every few deaths if I didn't just want to give up and skip to the next level. Oddly, however, the next two bosses were downright child’s play in comparison. A level later in the game likewise caused me a good dozen deaths, but the levels following it were as simple as those before. These moments really stick out as the rest of the game has a decent difficulty curve that teaches you what you need to know and subtly forces you to practice your skills until you're more than proficient in them. Outside of the main stages, there are also 40 unlockable challenge rooms. Each of these contains four rooms with a chest. You have 15 seconds in each room to get the chests. They are a fun way to practice all you have been taught in the game. While unlocking all the challenge rooms is one way the game rewards replaying main story levels, the other is even more enticing: pure Nintendo cuteness. The art style in Kirby: Rainbow Curse is one of claymation—from the cutscenes to the character models, everything looks like it's made of clay. And your reward for collecting the optional chests hidden throughout each stage are the character models for the game—which just look amazing when viewed in the game's gallery. Another collectible comes at the end of each level where, with careful timing, you can nab a page of Eleene's picture diary. Each of these tells the story of the stage in Eleene's own words with some insanely cute child-like drawings accompanying them. All in all, Kirby: Rainbow Curse has a good amount of content, especially for a budget title. It's a fun little mix of platforming, puzzles, and physics—and a whole lot of Nintendo's trademark cuteness. Heck, it's worth a play for the claymation style alone. Now if you'll excuse me, I have the sudden and powerful need to watch some Wallace and Gromit. Kirby: Rainbow Curse was released in Japan for the Nintendo Wii U on January 2, 2015. It will be released in North America on February 20, 2015, and in PAL territories later this year.